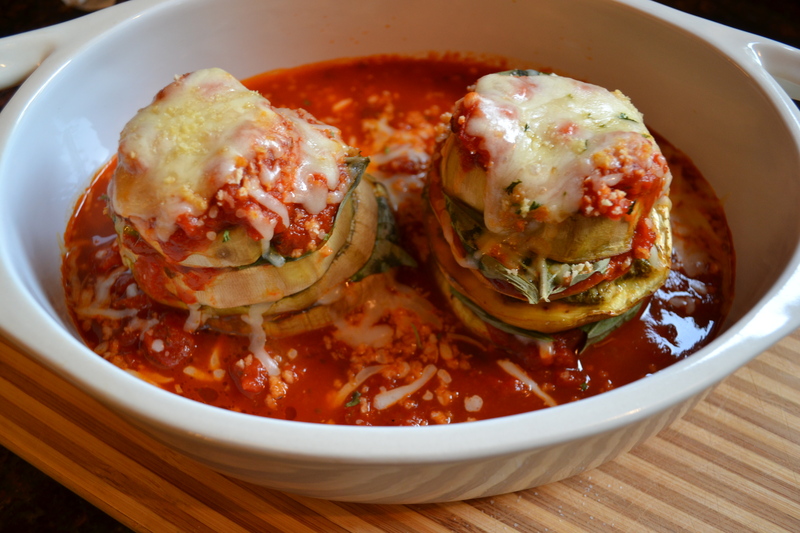 Got an eggplant in our veggie box and couldn’t decide what to do with it…. I came across this recipe on Pinterest and we were pleasantly surprised. It was delicious! For the vinaigrette: Whisk the oil, vinegar, salt, pepper, cinnamon, and cumin until thick and blended in a small bowl. Stir in the shallots. Set the vinaigrette aside. Transfer the quinoa to a large bowl; fluff with a fork. Add the vinaigrette, eggplant, apples, walnuts, sunflower seeds, and cranberries. Toss to blend. 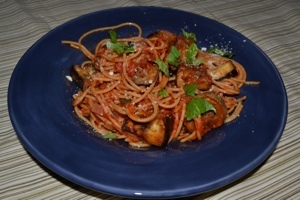 being not so huge fans of eggplant, but getting them in our veggie box – this actually came out really good! do not forget the feta! Preheat oven to 420 F. Line a baking sheet with foil. Grease the sheet lightly with olive oil. In a large bowl, mix cubed eggplant with 2 tablespoons olive oil, and season with salt and pepper. Spread chopped eggplant over the lightly greased baking sheet. Roast for 20-25 minutes (or more, depends on your oven) until eggplant softens. Midway through roasting, take out the sheet and flip over eggplant cubes to the other side using spatula – that will help even out the roasting. Once eggplant is done, immediately remove it from the baking sheet into the same skillet with spinach, off heat. Immediately add quinoa and second clove of minced garlic. This will allow cooked eggplant to release some juices when mixed in with quinoa. Mix everything well, off heat, and season with more salt if needed. 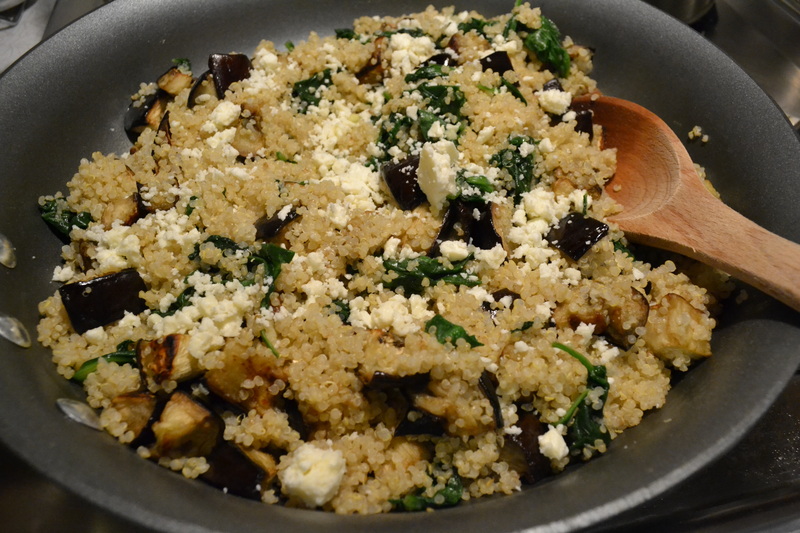 Don’t add too much salt or omit it altogether as you will be using Feta cheese too. Top with Feta cheese. Got an eggplant in our farm box and decided to try something new with it. These were eh. Too mushy for my liking! While the eggplant roasts, thinly slice the fresh basil leaves (if using) and combined freshly grated Parmesan and low-fat mozzarella blend. After 25 minutes or when eggplant pieces are done, remove eggplant from the oven and turn oven setting to broil. Spread a few tablespoons of sauce on the top of each eggplant slice, sprinkle with thin basil slices (if using) and top with a generous amount of cheese. Put pizzas under the broiler until the cheese is melted and slightly browned. Serve hot, with red pepper flakes to sprinkle on pizza if desired. This is another one of those recipes that came along at just the right time! 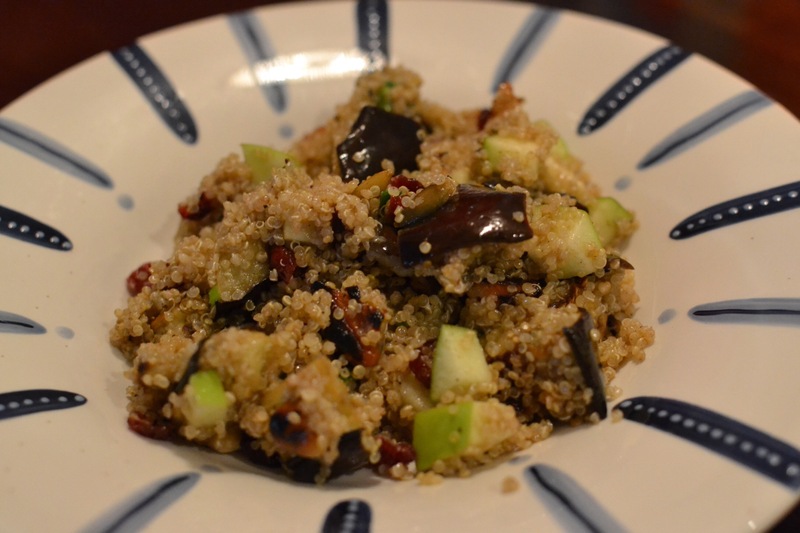 We got an eggplant in out fresh box… Surprisingly I liked this dish more than the husband. 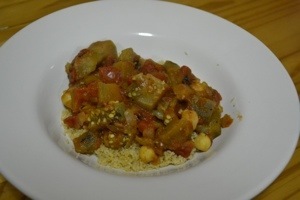 Even though the eggplant was soggy the couscous and chickpeas kind of made up for it. In a large saucepan, whisk together the tomato sauce, cumin, curry powder, 1/2 cup water, and 1/2 teaspoon each salt and pepper. Stir in the tomatoes, onion, and eggplant and bring to a boil. Reduce heat and simmer, covered, until the eggplant is tender, 20 to 25 minutes. Add the chickpeas and cook, uncovered, until the chickpeas are heated through and the mixture has slightly thickened, 4 to 5 minutes. Meanwhile, prepare the couscous according to package directions. Serve the stew over the couscous. Got a beautiful eggplant in the fresh box and thought I’d try one of the recipes I’d pinned for eggplants. I wasn’t expecting much from this recipe, but it came out really good even though I forgot to do step 5! Yum will definitely make this again! 1. Preheat oven to 425°F. Slice the eggplant and tomatoes crosswise into ½-inch-thick pieces. Place 8 eggplant slices in a single layer on a baking sheet coated with nonstick cooking spray. 2. Combine the olive oil, vinegar, salt, and pepper. Brush the mixture over the eggplant and tomato slices. Set the remainder aside. 3. Bake the eggplant slices for 10 minutes. Turn them over, brush with more of the olive oil mixture, and bake for another 10 minutes. Set aside. Place the tomatoes on the same baking sheet and bake for 2 minutes, until soft. 4. 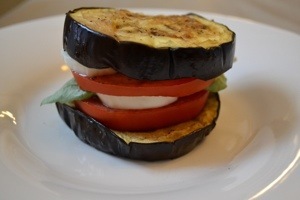 Form the stacks: Place a slice of cooked eggplant on a plate. Top with a tomato slice, a slice of mozzarella, a basil leaf, another tomato slice, another slice of Mozzarella, and finish with a second slice of eggplant on top. Repeat to make three more stacks. 5. Return the stacks to the oven for 2 minutes, until cheese is melted. Top each stack with a drizzle of the remaining oil mixture and a basil leaf. Serve immediately. More eggplants for the csa. I think, I know I’m done with eggplants… This is it :). This was ok. I wasn’t a fan, too bland and mushy. The husband liked it ok. It’s not a keeper for us. Preheat your oven to 350°F. Heat a large frying pan over medium-high heat. Once hot, add the oil and once the oil is shimmering, add the eggplant. Fry for 8 minutes, stirring pieces occasionally. Using a slotted spoon or spatula, transfer them to paper towels to drain. Add celery and carrots to remaining oil and cook for 3 minutes before adding onion and garlic. Cook together for 5 more minutes on medium heat. 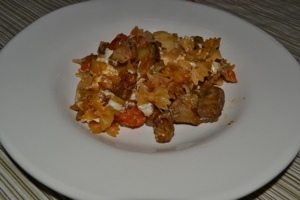 Stir in the pasta and tomato paste and cook for two minutes more. Off the heat, add the oregano, mozzarella, parmesan, tomatoes, fried eggplant, lemon zest, 1 teaspoon table salt, many grinds of black pepper and the stock and mix well. Transfer mixture to an ovenproof baking dish. Cover with foil and bake 20 minutes, then bake 20 minutes without the foil. Let rest for 5 minutes before serving. I was surprised how good this recipe came out. 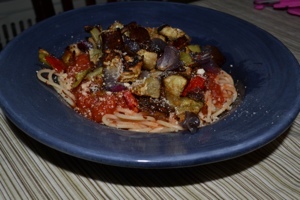 I had eggplants, peppers and onions to use up from the csa, so when is saw this recipe it was perfect. Definitely don’t scrimp on the Parmesan or red pepper flakes. Toss cut vegetables with olive oil, garlic, salt and pepper and spread out on a large baking sheet. Bake vegetable mixture for 20 minutes. After 20 minutes, check on vegetables and gently toss to make sure they cook evenly. Bake for an additional 20-25 minutes until vegetables are nicely browned and roasted well. Set vegetables aside. While vegetables are roasting, begin to cook pasta according to directions. When done, drain and place pasta back into pot. Set aside until sauce is ready. In a large sauce pan, heat diced tomatoes and tomato sauce. Season with a big pinch of oregano, salt and pepper. Bring to a boil, then down to a simmer. Cook for about 15-20 minutes. Add a cup of sauce over cooked pasta and gently toss. Serve pasta family style in large bowl (or in individual bowls) with additional sauce and roasted vegetables over pasta. Garnish with lots of freshly grated Parmesan cheese and red pepper flakes. Trying to use up the eggplant from the csa. I had made this once before and we liked it, so I thought I’d make it again. 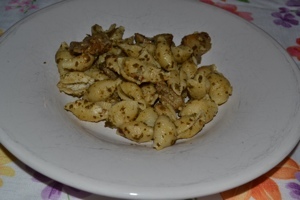 The original recipe called to make the pesto from scratch, but I don’t have time and had some of the bottled stuff to use up… Still good.. As I was eating it though i remembered that last time I thought it was missing something well i still do, just don’t know what! 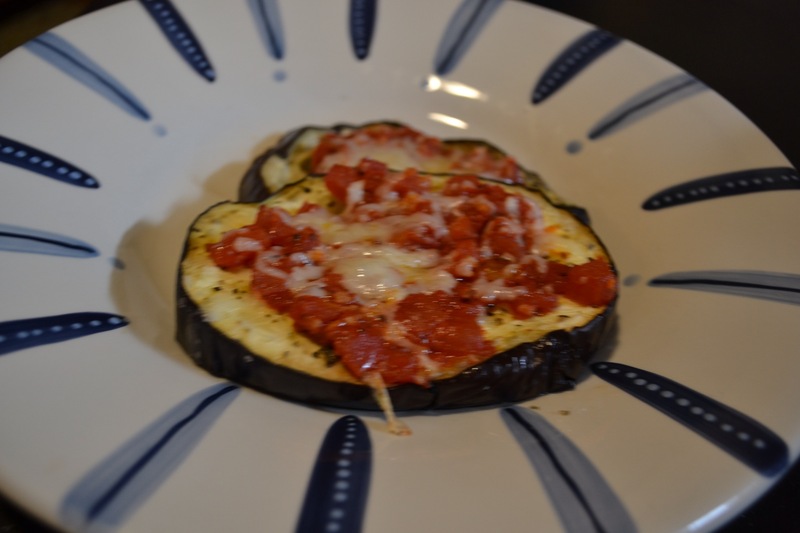 I’m not a big fan of eggplant, if you’re a follower of this blog you know this! The past few weeks we’ve been getting eggplant as part of our CSA share. Not wanting it to go to waste I needed to find a recipe that looked appetizing to me. This one looked ok and had good reviews so I gave it a whirl. The original recipe called for cherry tomatoes, but I had just used the last of mine in a nice big salad, so no cherry tomatoes in my version. This recipe was ok.. A nice big slice of garlic bread would have been great! First, make the tomato sauce: Heat the oil in a large saucepan over medium heat. Add the onion and garlic and cook, stirring, for 7 to 10 minutes until the vegetables are soft but not browned. Add the tomatoes. Add the basil and season with salt and pepper. Cook until the sauce is reduced and thickened, about 10 minutes. Cut the eggplants crosswise into chunks/cubes and put them in a large bowl. Add the garlic, salt, and pepper, and drizzle generously with olive oil. Toss to coat, drizzling in more oil if you needed. Arrange in a single layer on a baking sheet and roast 20 minutes until eggplants are very tender. While the eggplants are roasting, bring a large pot of salted water to a boil for the pasta. About 5 minutes before the eggplants are done, drop the pasta into the boiling water and cook until al dente, 6 to 8 minutes. Drain. Bring the tomato sauce to a simmer and pour it into a large pasta bowl. Add the drained spaghetti and stir to coat with the sauce. Fold in the eggplants. Add the cheese and basil, and another drizzle of oil, and toss gently. Serve immediately and pass extra cheese at the table. Prepare the eggplant by cutting the tip and ends off, then stand it up and with your knife peel the skin off in a zebra fashion, striping it as you go around, leaving some skin on and taking some off. Then slice your eggplant into 3/4 inch rounds. Toss with olive oil and bake in a 450F oven until golden and tender. 3. Add final eggplant slice, more sauce and another piece of fresh mozzarella. 4.Top with more sauce, toasted breadcrumbs and grated cheese. Repeat for as many stacks you’ll be making. 5.Bake uncovered at 375F until heated through and cheese is melted.